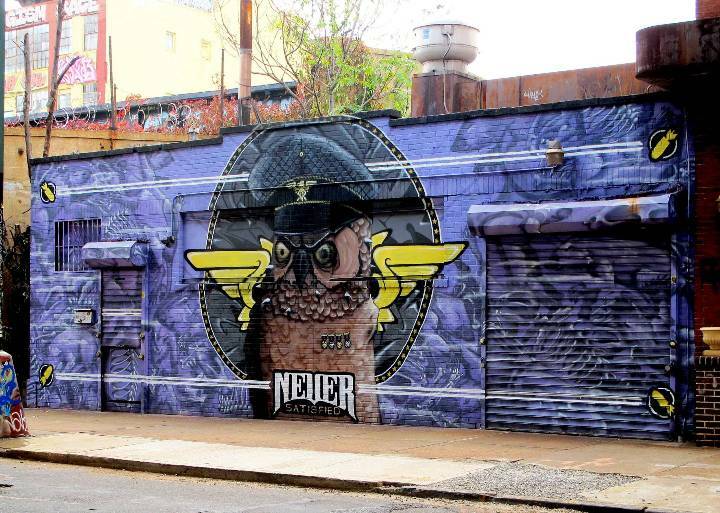 Interview with Brooklyn-based street and graffiti artist Never. For the past year, Atlanta native NEVER has been gracing the walls of New York City with a range of artwork from first-rate graffiti pieces to stylish street art murals. 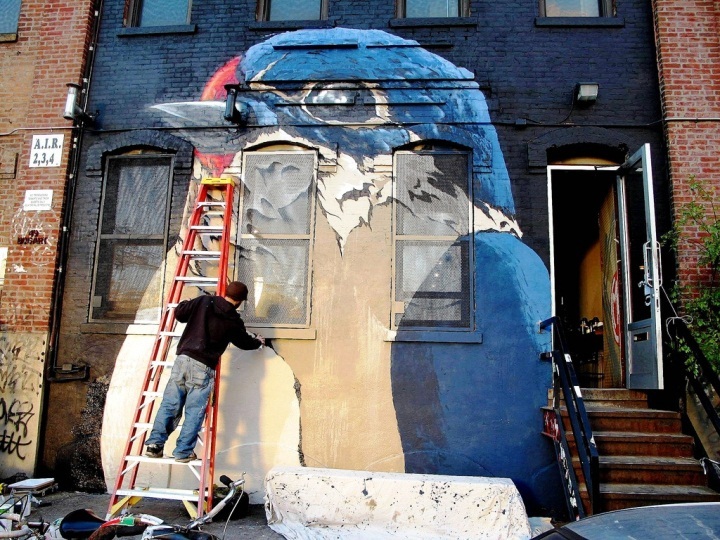 Recently Street Art NYC had the opportunity to speak with him. We’ve been wondering about your name, NEVER. It must have a story! After I’d been writing for a few years, my friends started to make fun of me for being so overly critical of everything I do. They started calling me “Mr. Never Satisfied.” That name stuck. We started noticing your work here about a year ago – when we met you at 5Pointz. What brought you to New York City? I grew up just outside of Atlanta. It’s a great city but also a very small city. I got tired of it and eventually decided it was time to move on. I couldn’t even walk into a random grocery store without bumping into five folks I knew. How do you feel about Brooklyn – where you are living now? I love it. I love its diversity, and New York City is a constant source of inspiration. Anything about New York City you don’t like? There are far too many cops here. I rarely had trouble with cops down in Atlanta, but here they hassle me all the time. While throwing out the trash, I was accused of drinking in public. Then they accused me of painting graffiti because they noticed some paint on my arms. I do a lot of painting at my job so it’s very rare for me to actually NOT have paint on me. One of my friends here spent a night in jail for having a sharpie on him. He isn’t even a writer. You seem to seamlessly blur the line between graffiti and street art. How did it all begin? I’ve always been good at drawing since I was a kid. Then I hit my skater punk days and stopped drawing for a while. I began tagging on things when I was 14 or so. A girl in high school cheated on me, and I got a laugh out of writing the word “Trust” everywhere. At the time I didn’t think it was something I was going to get so hooked on, and I definitely did not think of all the politics behind what I was doing. After a few “name changes,” I did my first actual “piece” under a bridge when I was 16. We’re curious about your owl. It seems to surface in all of your pieces. A little over a year ago — just before I moved to NY — I got stuck in a hospital room in Atlanta overnight with a nasty staph infection while “recovering” from knee surgery. I was in a drugged-up state sitting in a hospital bed in a depressing hallway, and for whatever reason I felt compelled to draw a sad little handicapped owl. After that night I decided I liked the thought of making that a recurring character for me. I studied graphic design at a university in Atlanta. But to anyone who thinks that getting a formal art education makes you a legitimate artist, you are dead wrong! Have any specific artists inspired you? I love Aryz. He inspired me to pick up an extension pole! 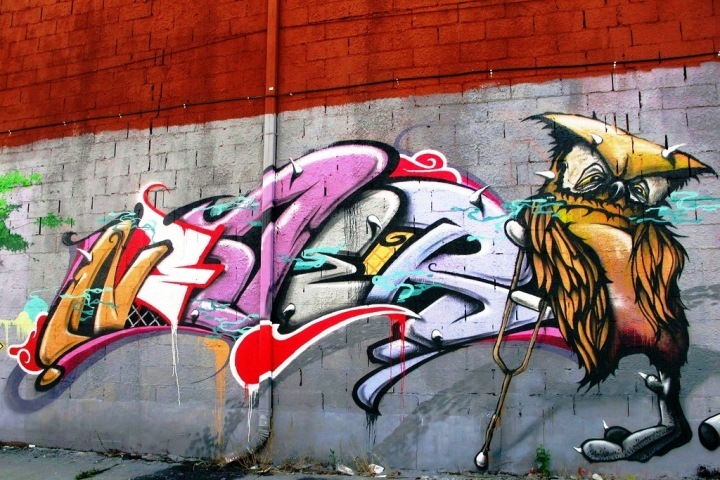 I also love How and Nosm, Daim, Roa, Nychos, and Os Gemeos. Honestly there are way too many others. But any artist I had to study about in school lost credibility….except for, maybe, Duchamp. That dude was pretty hilarious. I always had a tendency to reject information that I felt was being “fed” to me. As you actively collaborate with both graffiti writers and street artists, what differences have struck you between the two? Any other differences you’ve observed? Another big difference is that a lot of writers have no interest in getting any messages across. It’s a lot more about technical skills and/or having balls to do crazy things. Most of my graffiti friends don’t like any kind of political references in their pieces. But if you are going to call yourself a “street artist,” then you are a fool if you don’t pay respect to graffiti, whether you like it or not. The way I see it, the lines between graffiti and street art will continue to blur. Have you ever created artwork that is overtly political? I despise corporate crime. And when I went through a phase of creating portraits, I was obsessed with Ken Lay, the main guy behind the Enron scandal. I couldn’t stop painting portraits of him. I did it for about two years, just before the Enron trials started. My graff friends hated it, but it managed to get attention from people who otherwise did not follow graff. How have people here responded to your art? I’m not very up on what people think. I do what I do regardless of what people think of it. It’s nice to get the occasional compliment here and there, but at the end of the day I am doing what I do to stay sane. Have you painted outside of the U.S.? I’ve painted in Barcelona, Berlin, Venice, Milan, and Tuscany. I hope to travel more once I get myself a little more financially stable. What is your ideal space to paint? I love empty buildings with awesome textures and walls with history that I can work my pieces around. Any memorable experiences while getting up on the streets? Many back in Atlanta — amidst the crackheads, prostitutes and perverts. There are way too many funny stories to go into. I’ve also stumbled on to a couple of meth labs and discovered a bag of heroin stashed in a cinder block. 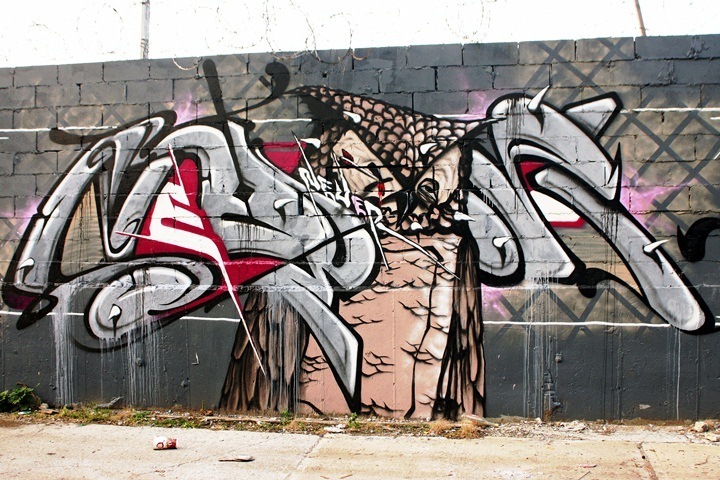 We’ve found almost a dozen walls of yours in Bushwick. Have you a day job? I pick up work in a carpentry shop. I help build things for movie sets and fashion shoots. I also prowl around for graphic design work. I have not had a “normal” job with a set schedule in over seven years now. I’m kind of hoping to find some stability these days. What about the future? What do you see yourself doing in five years or so? Painting more ugly walls, I guess. I’m not sure. Well, you are certainly beautifying them. We’re looking forward to seeing many more! We stumbled across a mural while visiting, the emotion in the owls face was breathtaking. Love his stuff. Love the vibe. Hi, I have seen many of NEVER’s pieces around Brooklyn. I love his stuff and want to get a hold of him to do some work for me. Any info would be greatly appreciated! I work for a marketing company and would love to have Never work on a piece for us. His work is amazing. If there’s any way to get in contact with him please pass him my info. I’m based out of Bushwick and work in downtown Manhattan. I suggest you contact him via his FB mail. His FB name is Dis Satisfied. Thank god dude made it out to do murals on Queens! This guy is sick, He is the perfect artist to me.